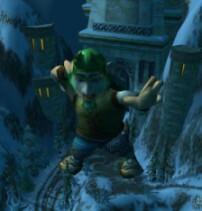 "Since 2004, the award-winning* Gnomeregan Gnews Gnetwork has been tireless in their journalistic quest to bring you the most important news affecting the world of Warcraft. In their latest segment, they turn their attention to the goings-on in some place called "Outland". Join the intrepid reporters of the GGG as they investigate the seemingly endless battle at the Dark Portal, the mysterious depletion of Zangarmarsh, and the source of a foul odor emanating from Shattrath's Lower City..."
Check out the new video installment from the hard-working Gnomeregan Gnews Gnetwork, on our front page! Bringing the important stories of Azeroth to you, in high-fidelity! Did you work on that? lol It's pretty funny, who wrote it? :-D i love the work they managed to do with faces!!! Wow, I'm really impressed! Are there other epidoses that I have missed? Is this series new or have I been living under a rock? I really like what they were able to do with the eyes and mouths! This is really great! I watched it a few times, even frame-by-frame to form some new techniques. I'll probably be talking about this in the next podcast episode. Great job to everyone involved with this video!